The good infographic. - nexxar lab. - nexxar lab. Use of infographics in annual reports. What makes an infographic an infographic? Here is a hint: The answer is right in front of you. Yes, you guessed it: It is the information. Meaning, if the graphic’s purpose is not only to be visually appealing and decorative but to also convey some information, then we can talk about an “infographic”. Fast and easy to understand: Studies have shown that the human brain is able to process a visual scene in just 0,013 seconds, which is insanely fast! But how is this possible? Well, you sure heard of the saying “Practice makes perfect”: Our brain is very well trained to understand what we are looking at because this is what we are doing all-day long. If you think about it, an infographic is basically visual information. As a consequence, we understand an infographic much easier and faster than read or heard information. Reliability: We don’t just assimilate visual information faster, we also trust more in what we see. That means we believe the statements made in a graphic more than in a text or a speech. That’s why a lot of people use infographics in their speeches to “proof” that their statement is true. Evokes interest: Nobody likes long, complicated and dry texts. And let’s be honest: In the world of reporting, we deal a lot with very large amounts of texts, that make it hard to filter the most relevant information. An infographic, however, is an eyecatcher and signalises immediately that the shown content is important. Outreach: Since an infographic is more appealing than a text passage and can be considered as “snackable content”, it is suitable for different kinds of platforms, like social media, to expand the outreach of the information and to increase hits. When it comes to deciding whether or not to use an infographic for specific content, there is one simple rule that helps: The use of an infographic is helpful or even necessary when text and picture is not enough to display the content properly. And by properly, we mean that the reader could have problems to understand the information. So, when you take a look at the information you want to present, try looking at it from the user’s perspective. Do the main facts become clear from a written text paragraph? How easy is it to quickly understand the facts? Is there any way to improve understanding with the use of graphics? If yes, do so. Animation is generally a big trend in online design. So why not use it for infographics, right? Yes, but only with caution. Of course, the use of animation can attract the user’s attention and help to understand the displayed information better. But we also have to keep in mind that the information in an infographic should always be in the foreground. That means we have to be careful not to distract too much from the content because of some nice, but possibly unnecessary, effects. When it comes to explaining processes, animation can be a very helpful tool. 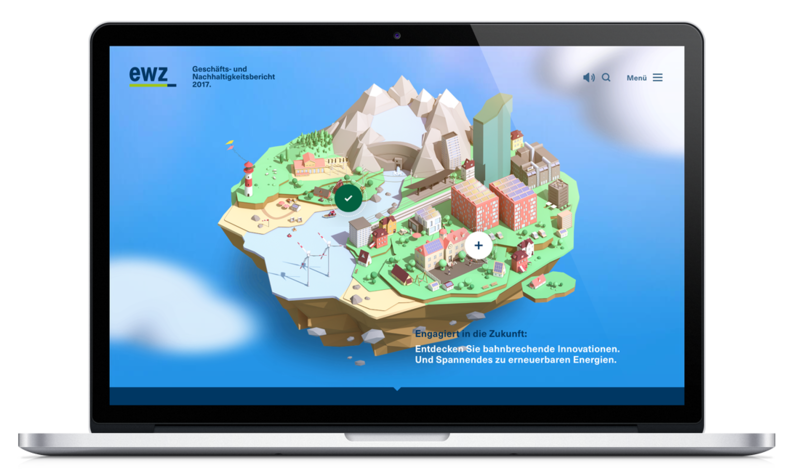 A good example for that is the animated infographic in Datev’s Annual Report 2017. 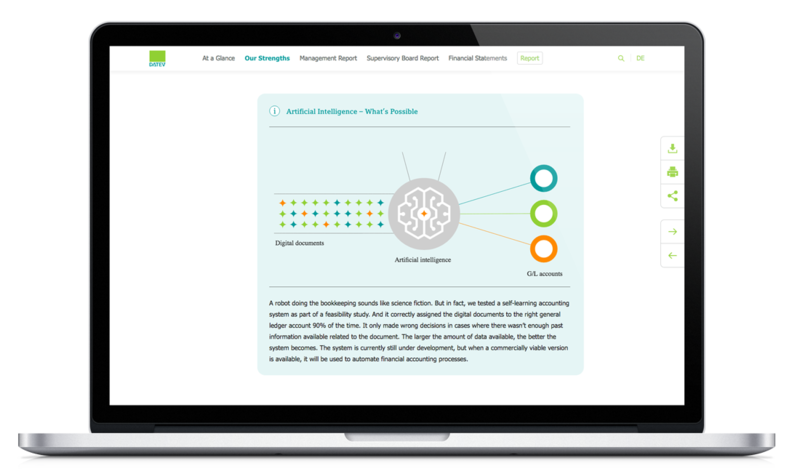 This infographic shows how artificial intelligence improves digital bookkeeping. Since this process requires a little bit more time to fully understand, the animated infographic helps a lot to follow the written explanation. We are able to see every state of the process in one flow without having to connect the dots. 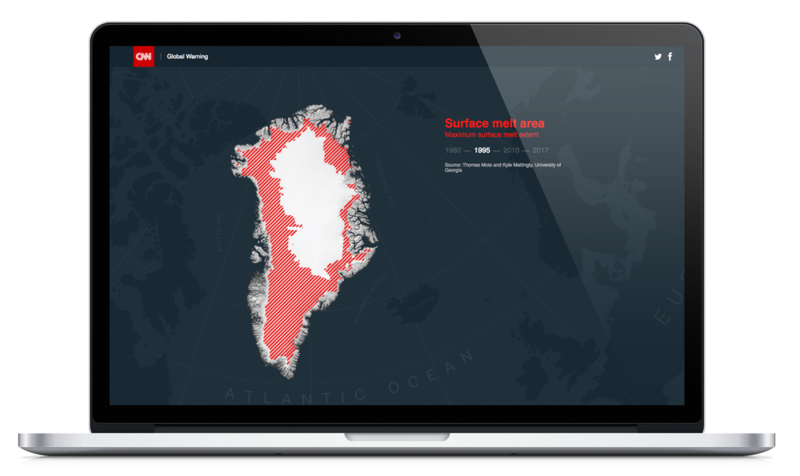 Another current trend is incorporating interactive elements in infographics. Interaction can be used to show correlations by involving the user and making them discover more content, which can be informative and entertaining at the same time. Interaction can also be used to display additional information or save space. But of course, “hiding” content can be a risk because it may happen that the user misses the clickable elements. That’s why it is important to always make sure that the interaction makes sense in the infographic and that the clickable parts are very obvious. This infographic is accompanied by a lot of text. To make the information more compact, we decided to make the wheel interactive. Instead of showing every paragraph one below the other, the paragraphs are incorporated in one simple infographic, so that the user can decide which content to display. The plus signs and the hover effects signalise which elements of the graphic are clickable. Overall, the topic of this infographic isn’t very complex or difficult to understand but it makes the perception much more interesting and appealing. Sometimes simple changes can make a big difference. Of course, interaction can not only make information more appealing, it also has the superpower to simplify very complex information. 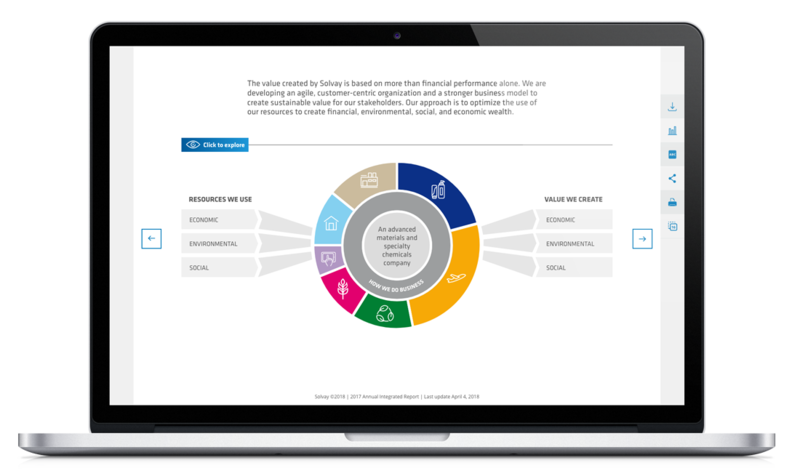 The example above shows the model for creating sustainable value in Solvay’s Annual Report 2017. It has a lot of key figures and information to offer which can be quite overwhelming when seeing it all at the same time. In print reports, the value creation can fill 2 to 4 pages. 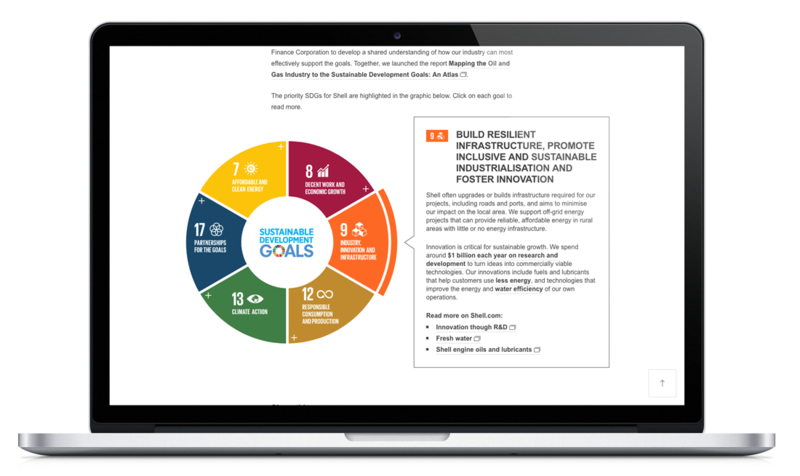 In the online report, we can use interaction to make the infographic compact and thus easier to process and let the user decide which information to display. In this case, interaction helps a lot to understand the complex information and to avoid having to constantly scroll up and down to make all the connections. Usually when we are displaying a map, we don’t just want to show the map itself but incorporate locations or additional information about specific areas of the map. In print reports, we have the possibility to arrange the information in or around the map until we are satisfied. Unlike online, where we have more than one layout. That’s why we need to make sure that the content is easy to read on every format and device. Having a static infographic with a lot of text on it would be a struggle to read and fully perceive on a mobile device. That’s where interaction can come in very handy. With interaction, we are able to incorporate all of the content without causing a chaos of information. 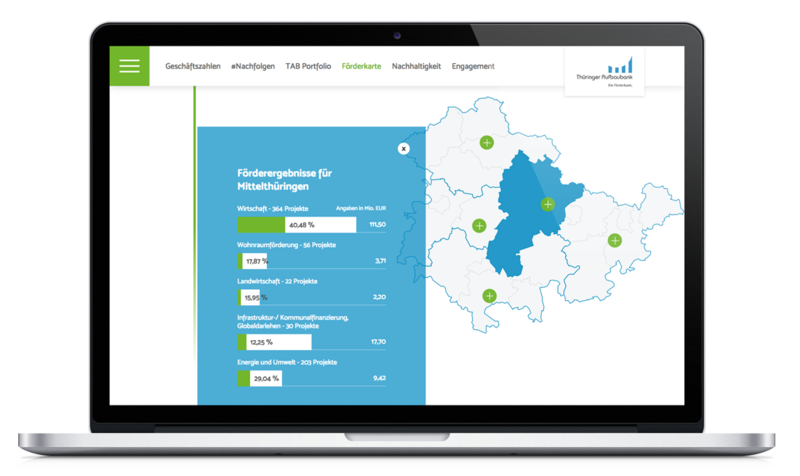 A good example of an interactive map can be seen in Thüringer Aufbaubank’s Annual Report 2017. The map is simple and easy to understand. Also, it is very clear that it is possible to click on various areas of the map. Of course, in the world wide web the possibilities are almost limitless. So, we also have the opportunity to mix and match various media and effects to make the content more interesting and understandable. For instance, we can combine animation and interaction in one infographic or we can include infographics in videos or multimedia storytelling. This infographic about nutrition and the human body is very informative and combines animation and interaction in quite a useful way. We can click on different parts of the body to see a simple animation that informs us about specific processes in the chosen area. 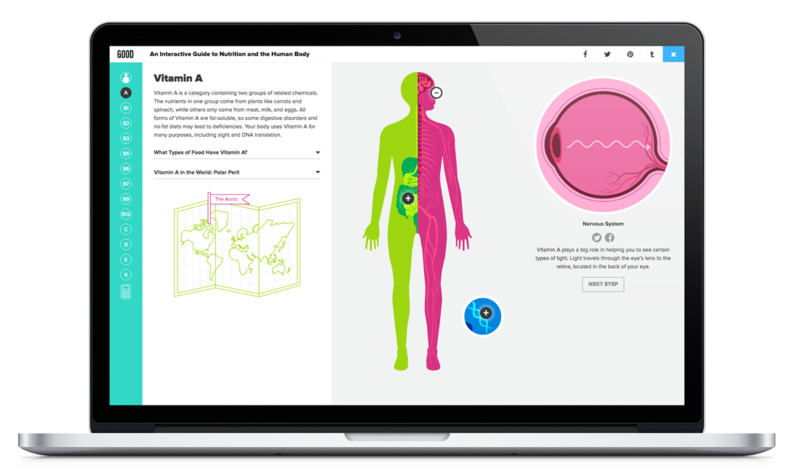 Next up is an example of a storytelling website that makes use of different media like video, audio and infographics combined with photos and incorporating motion. This example shows that infographics can also be used for more emotional or editorial publications. Incorporating infographics in storytelling makes the story more reliable and at the same time interesting and fascinating. Plus, the message is clear within seconds without even reading the text. A quite unique approach of an infographic can be found in EWZ’s Annual Report 2017. They created an animated, interactive world, which functions as the key visual of the Annual Report from where we can get to various stories and contents. Here, animation is used to make this illustrated world livelier whereas interaction is used to display more information about specific topics. In conclusion, and as you may already have experienced, the creation of an infographic takes time for both designers and clients but in the end, it has a lot of benefits for your content and a great impact on the user.